One new food I had to learn to cook when we moved to Malawi was boerewors. 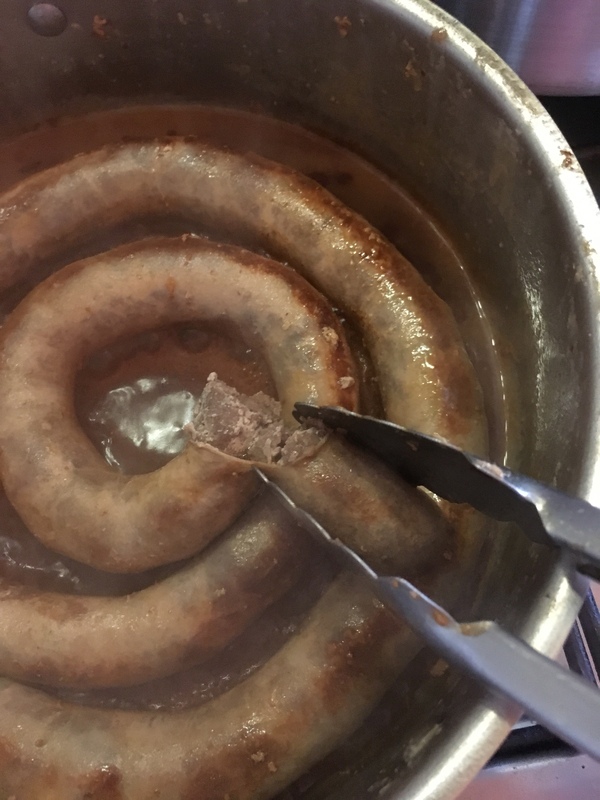 Boerewors, literally “farmer’s sausage,” is a South African favorite. A+ Geography students will know that Malawi is not in South Africa, but it is in southern Africa, and we do have a lot of South Africans who live here. And where you have South Africans, you have boerewors. The most common way to cook boerewors is on the grill, or braai as South Africans call it. Lay your sausage out on the braai and use large tongs to flip the whole thing. Pretty easy. Before we had a braai, my sweet friend Igna taught me a second way to cook it. I still use this method when I’m cooking boerewors that I know has a lower fat content. 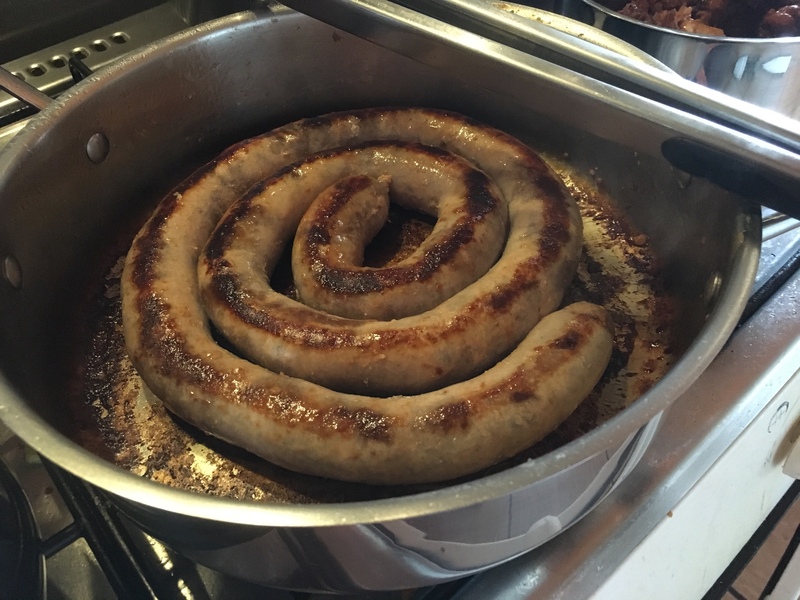 My friend Shannon made a batch of low-fat boerewors and it was so great that I bought it all from her! 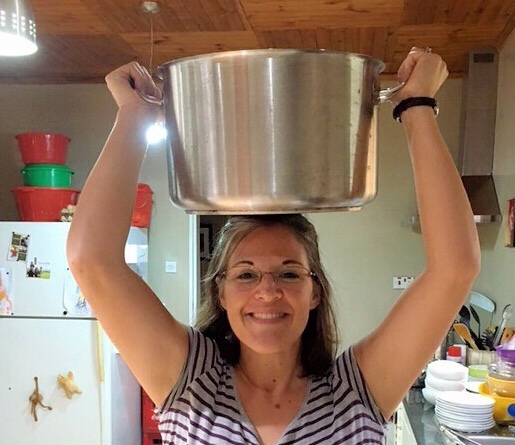 But if I’m not careful it gets dry very quickly… thus the stove-top method. First, I sear the sausage on both sides. The picture above is of the lovely sear marks it develops. Then I add about 1 cup of water to the pan and quickly clap on the lid to keep the steam inside. After about 10 minutes the boerewors is cooked through, moist, and perfect. How do I know it’s done? When I bend the sausage with tongs, it breaks off cleanly. All done! On to the table it goes! We had this sausage with some baked beans and fresh sweet corn on the cob. Smiles all around! Matt and I decided long ago, that a hotel was a much better idea than keeping a lizard as a pet. 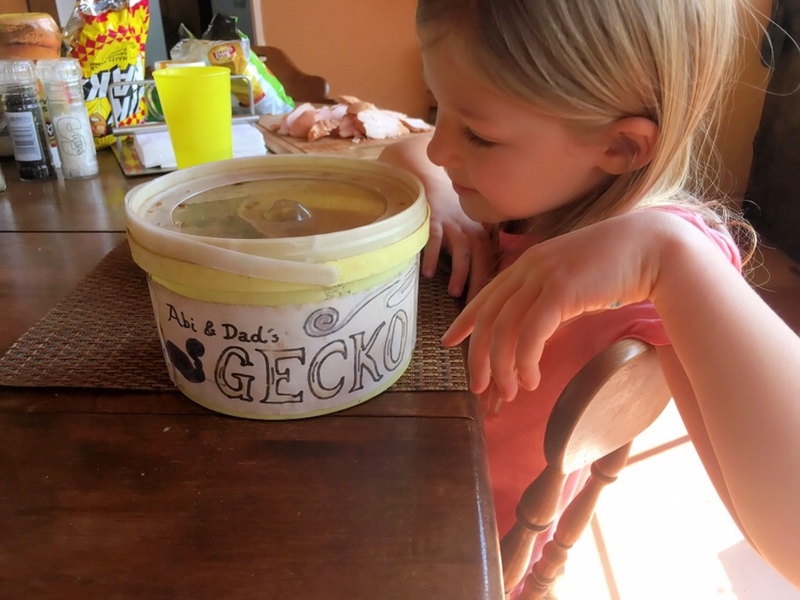 So we have geckos that check in – and out – on a regular basis. 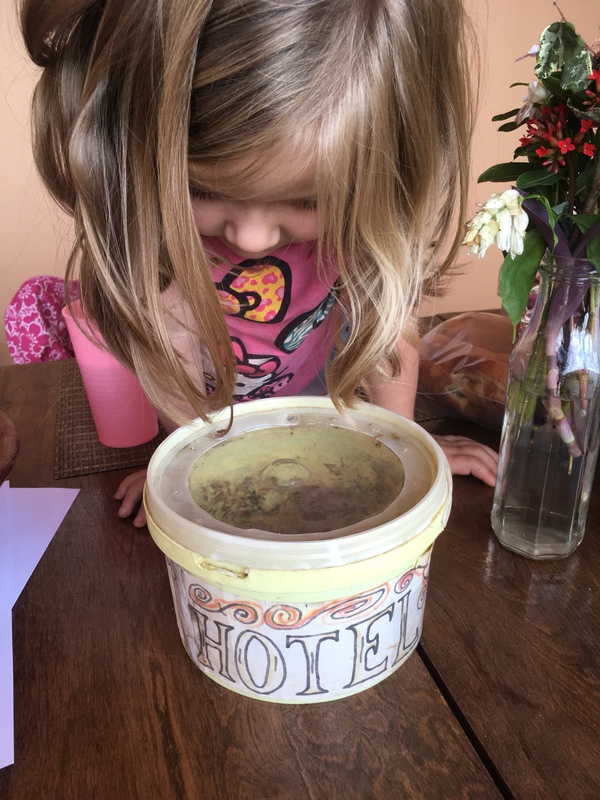 For instance, I found a little guy in our shower the other morning, so Abigail came to catch him and Naomi had the Gecko Hotel all ready for him by the time he was caught. We kept him for observation until the afternoon and then let him go in a more favorable environment. 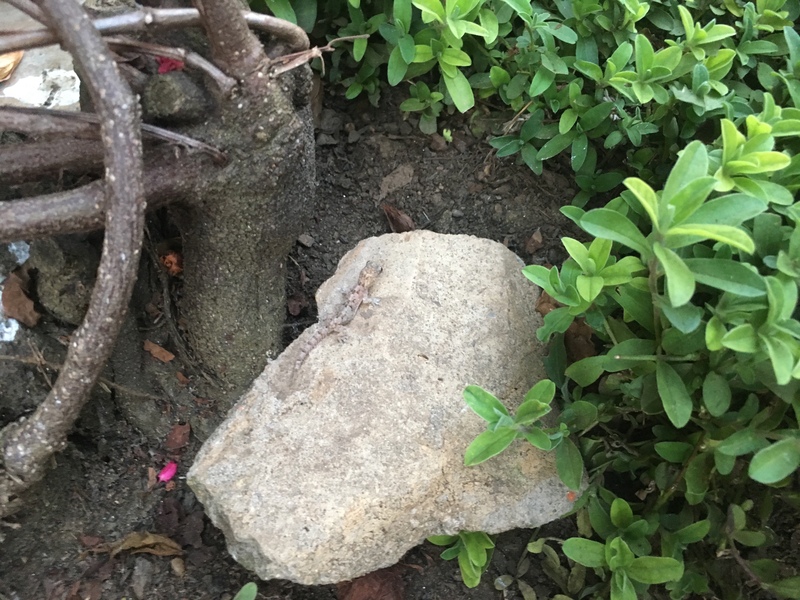 He was a cute little guy, and friendly – for a gecko. See ya, little guy! Enjoy the great outdoors! Several people have asked us over the years for recommendations of books to read about Malawi. 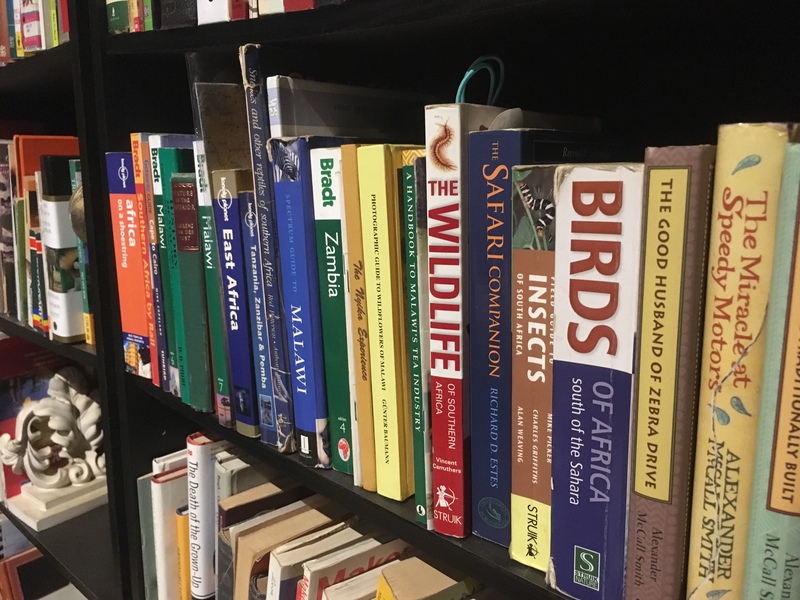 Here’s a little sampling of books we recommend to get you thinking about our corner of Africa. Most if not all could be found in your local library, but I’ve linked to each book on Amazon if you want to take a quick look there before you head to the library! The Daring Heart of David Livingstone :: Was he a missionary, an explorer, or an abolitionist? Yes. And the most famous European in this part of Africa. African Friends and Money Matters :: This book was key to helping us understand giving and possessions in our first couple years here. When Helping Hurts :: Sometimes charity can be helpful, sometimes it brings harm to the one receiving it. This book offers some thoughts on helping well and appropriately. The People of the Mist :: An 1894 adventure novel set in an undefined part of Africa that’s easy to imagine being Malawi: hidden civilizations, giant crocodiles, and daring escapes! Haggard’s Allan Quartermain series inspired countless modern adventure stories and films. The No. 1 Ladies’ Detective Agency :: Set in Botswana, but the feel of these books is so very similar to the feel of life in Malawi. I believe there are now 18 books in this series by Alexander McCall Smith. The Jungle Doctor Animal Stories :: This is a kids’ series, but they’re fantastic fables! They were written by a medical missionary in Tanzania, so many of the expressions and titles used throughout the 6 volumes are familiar to us. The Bradt Guide to Malawi :: The intro to this travel guide has some great summaries about living in or visiting Malawi. The rest of the book has been super-helpful as we have explored Malawi over the years. We actually own versions 5, 6, and 7 of this book! And finally, there are several claims that Malawi, Mount Mulanje in particular, inspired Tolkien’s Middle Earth, the setting for The Hobbit and The Lord of the Rings. Maybe, but probably not. Tolkien did visit Malawi, but not until after he had written about Middle Earth. However, we do have a Shire River, and I have caught myself more than once thinking “this totally looks like what I imagine Middle Earth would look like!” Abigail is pretty sure she has seen the Misty Mountains! So, for whatever it’s worth, you should read a bit of Tolkien if you want to know what Malawi looks like! Well, we found 2 leaks and a leaky elbow. “We” hardly includes me, but I took pictures! 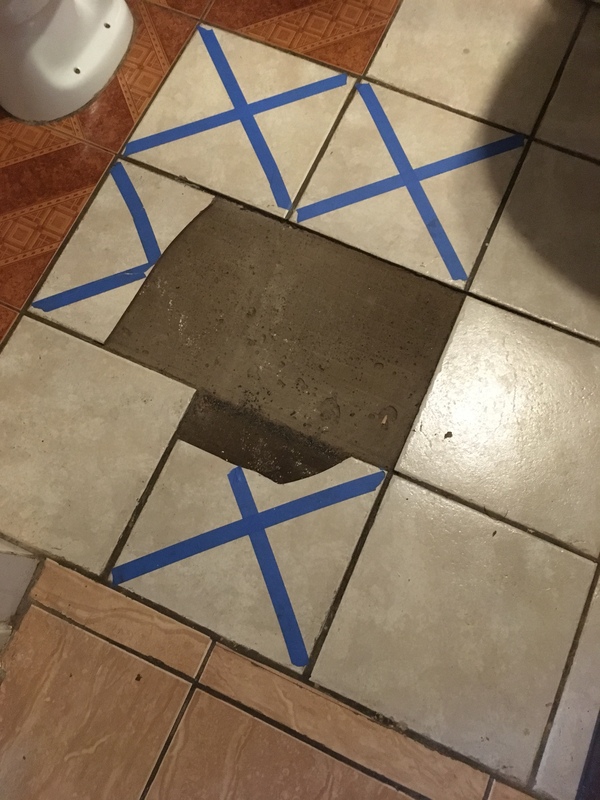 The wet patch with a hole in it is the leak that made the tiles huff and puff. When the water is on at the sink, you can see water bubble up in that hole! The leaky elbow is at that sink too: the dark stain running down the wall under the sink. Oh boy do we have a mess! First of all, this big leak is the bad boy who had been causing us trouble for 9+ years! The yellow arrows are pointing to places we have had to replaster the guest room walls (repeatedly) over the years. We’ve even given up painting over the plaster! Now notice the door frame, that is, what is left of the metal door frame. Over the years the damp has rusted the metal, so the rusted parts had to be cut off. We are having some new pieces made and will weld and cement them back in place. New pipe, new floor, new tiles, new door frame, new plaster, and then we might actually repaint those walls finally! 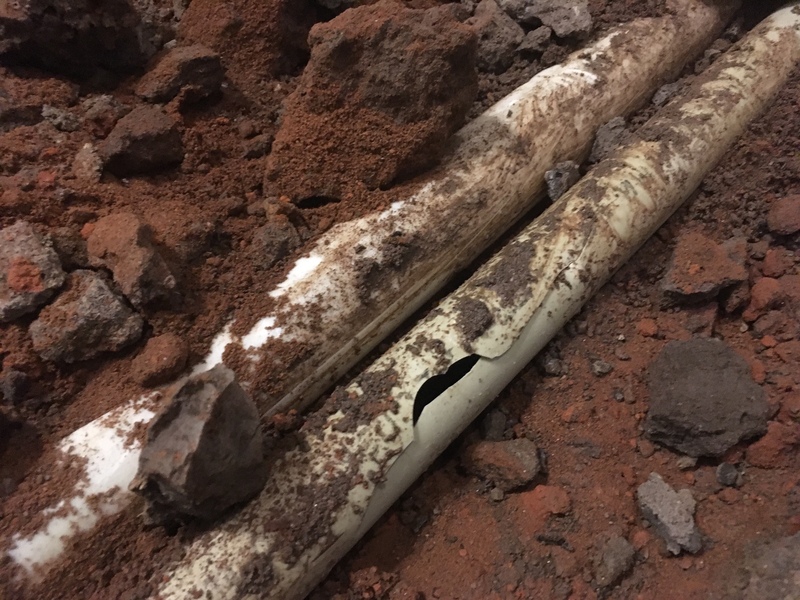 I’m just hoping and praying that the new pipe will slip nicely into the tunnels left by the old pipe and that we don’t discover any more leaks where the pipe goes under the hall bathroom shower or the guest bathroom shower. I’ll let you know if this project gets any bigger! Anyone who has stayed in our guest room will know that we have a water issue. 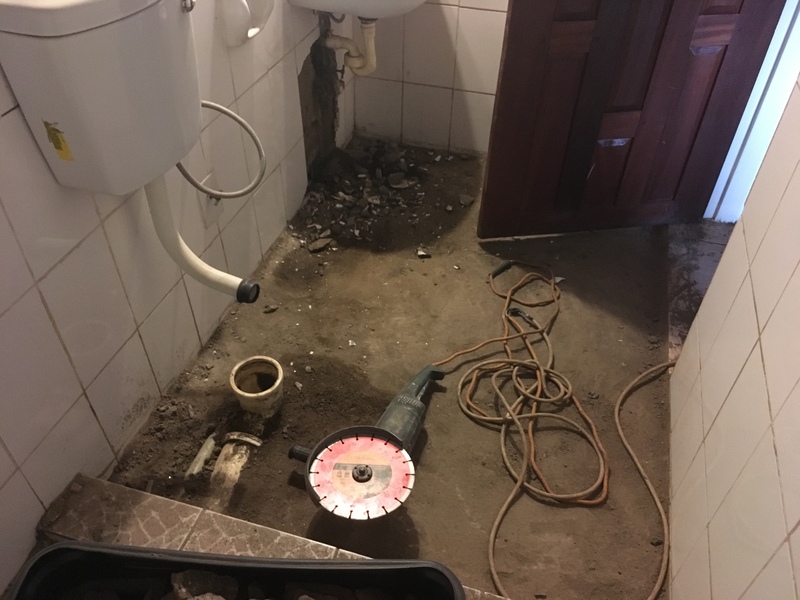 For years, we assumed the problem was because the builders didn’t put a damp-proof course under the floor. But then about 2 months ago, the floor in our hall bathroom started to make a puffing noise when we stepped on it. Uh-oh. We finally figured it out. We had a leak. There’s a good chance we’ve had a leak or two under the floor for years. 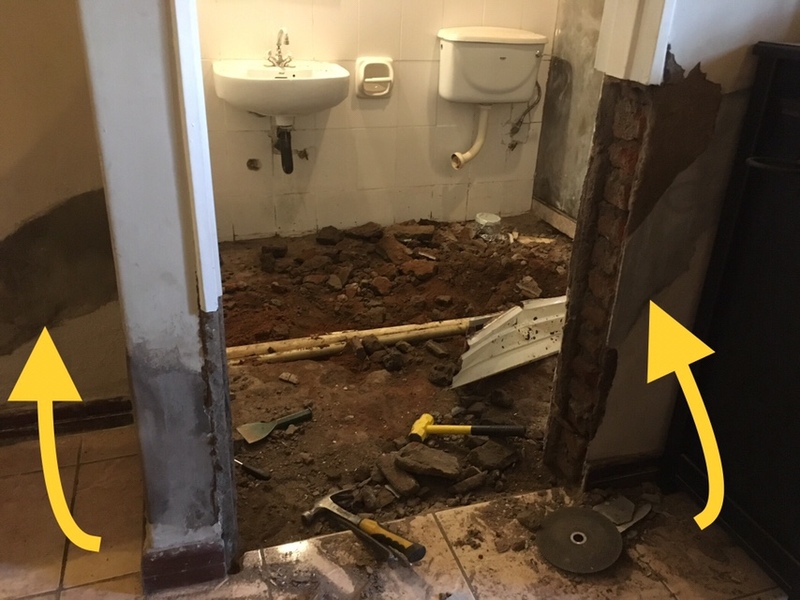 The guest room and hall bathroom share a wall, and since the tiles on the hall bathroom floor were having problems, we started in the hall bathroom. Would we have to take out the guest room or guest bathroom floor too? We hoped for an easy answer, but we weren’t going to hold our breath. We chipped out the grout and a few tiles came right out. 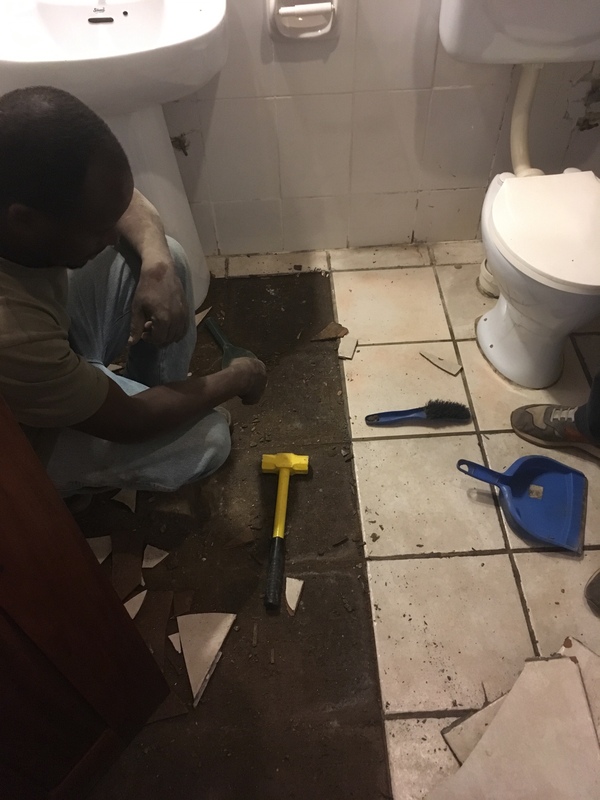 You’ll notice that this bathroom was the recipient of all the leftover tiles throughout the house, so I am perfectly ok replacing these tiles!!! This needed more work than we could do, so our friend Richard came to tackle it. And tackle it he did. Tiles, dust, concrete…. the chiseling and hammering finally got to me. It was so loud it hurt my eardrums and I could hear every hammer hit echo in my head. So the girls and I went on a field trip. We finished birds in science and are on to amphibians. 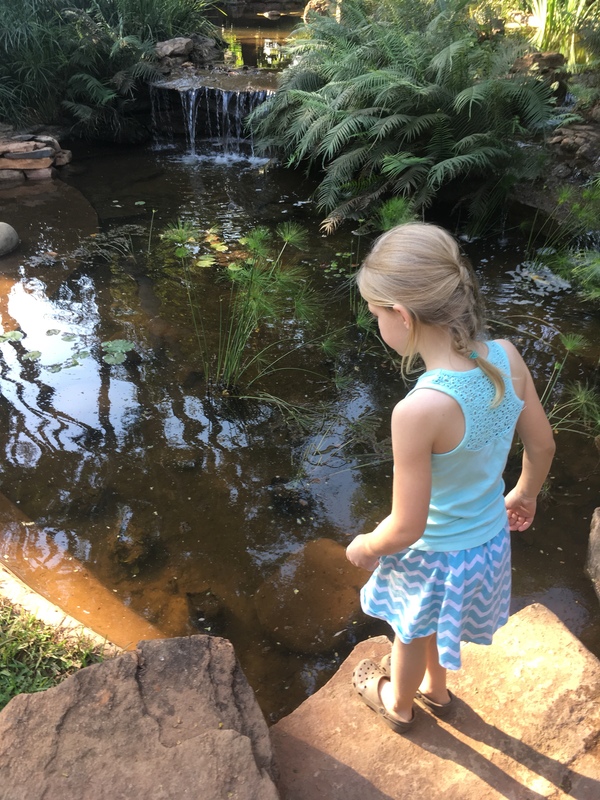 There’s one great place in town that has tadpoles and frogs, the closest thing we have to a botanical gardens: the Four Seasons nursery complex. 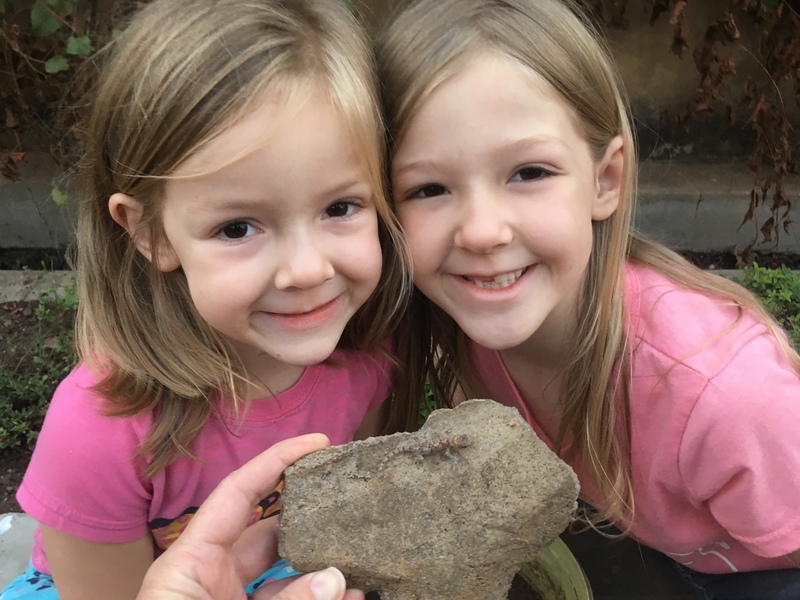 We went searching for tadpoles. There were several large tadpoles, just about ready to sprout legs! 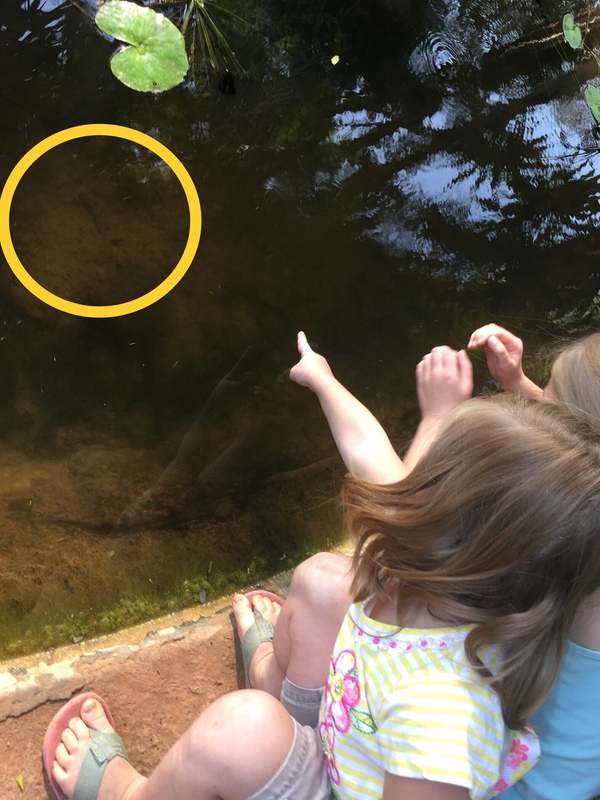 I circled one in the pic above – it does look like a stick in the picture, but in real life it was definitely a tadpole! 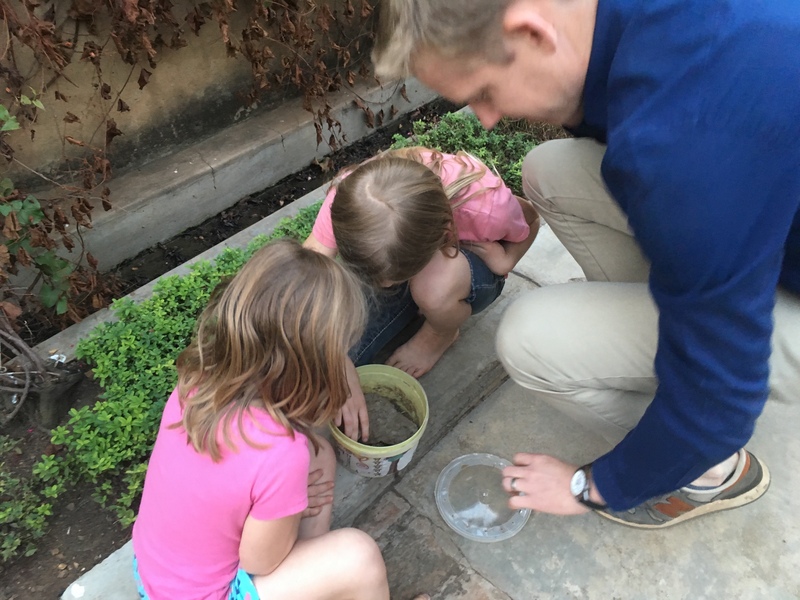 We stalled a little longer at Four Seasons, completing a nature scavenger hunt and buying some great petunias, but eventually it was time to head home and get dinner started. We came home to no tile in the hall bathroom! There is a leak in the sink plumbing! And that would explain the damp in the floors and the tile issues we had had. 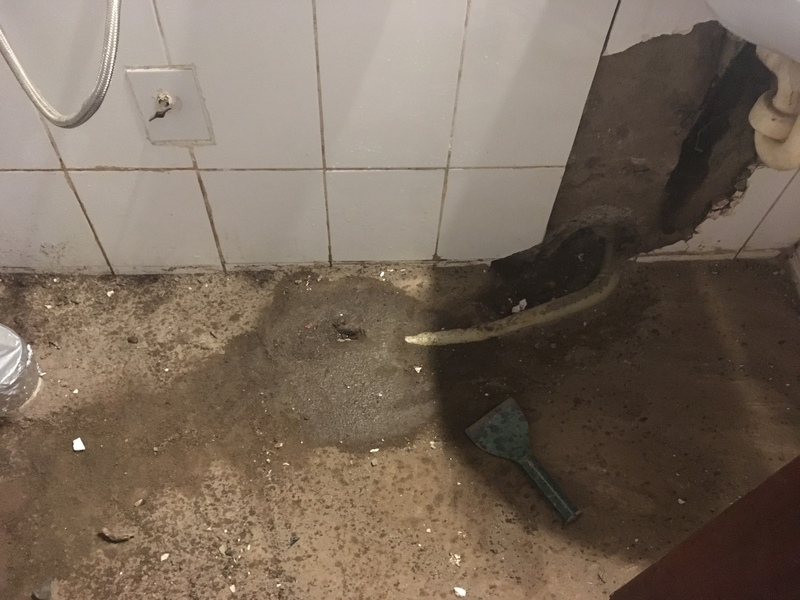 However, it’s not a big enough leak to explain the guest room and guest bathroom wall problems that we’ve had for years. So Richard has also started on the guest bathroom floors. Don’t be jealous, but wow isn’t that beautiful?!? 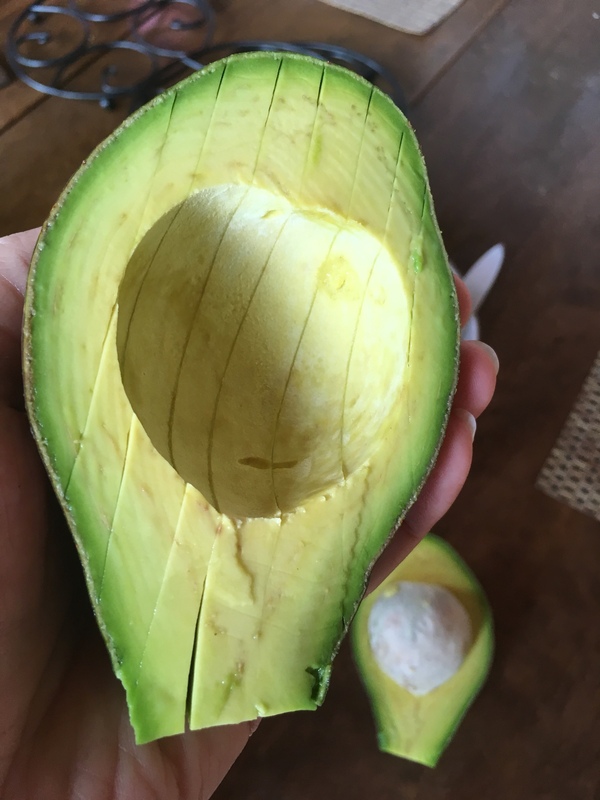 Our avocado tree produced some fantastic fruit this year. We had bucket-loads of guacamole! Yep, still hauling water! But thankfully only from one side of the kitchen to the other. Some friends of mine have had their city water off for weeks at a time and must haul their water from the local well. It makes me thankful for our water tower! 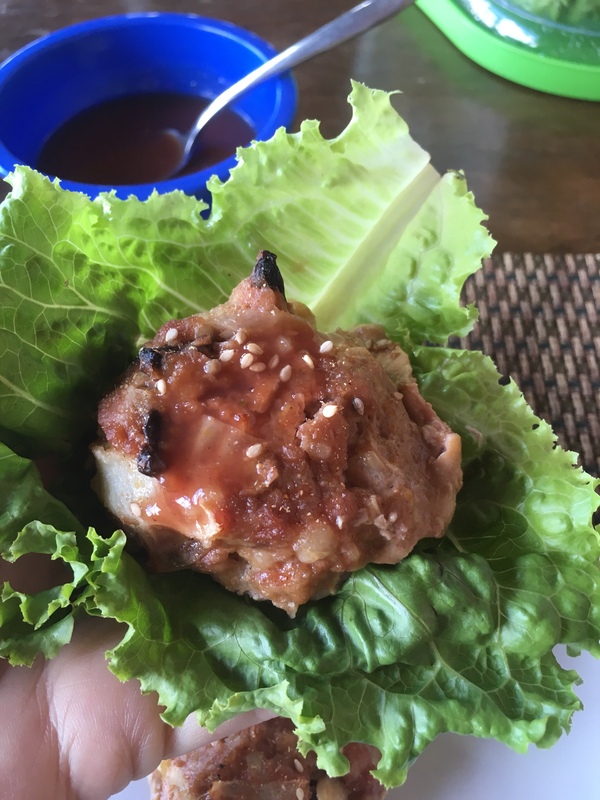 Pork meatballs with sweet and sour sauce in lettuce wraps… yum! I’ve been cooking my way through a fantastic “better than take-out” Chinese e-cookbook, and we are loving it! 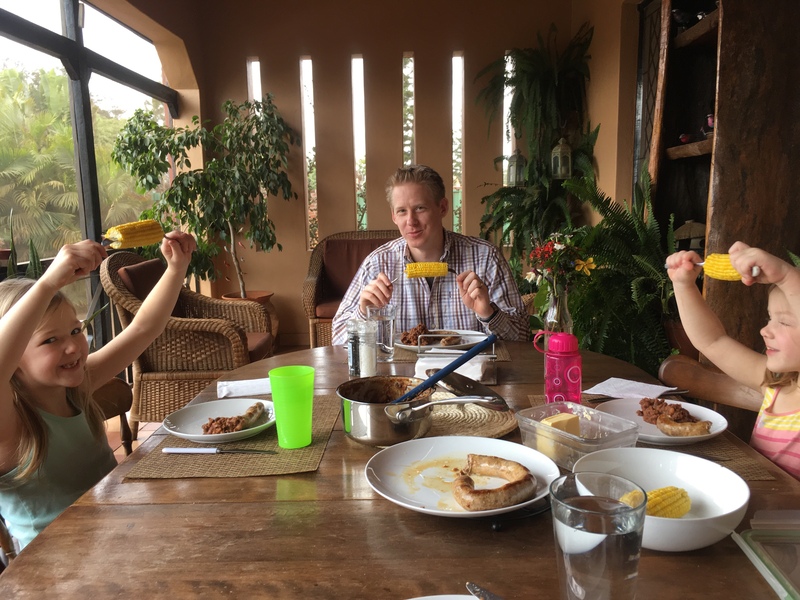 Our friends Chris and Ashley brought us wild raspberries after their recent trip to the Zomba plateau – the only place in Malawi that grows them! 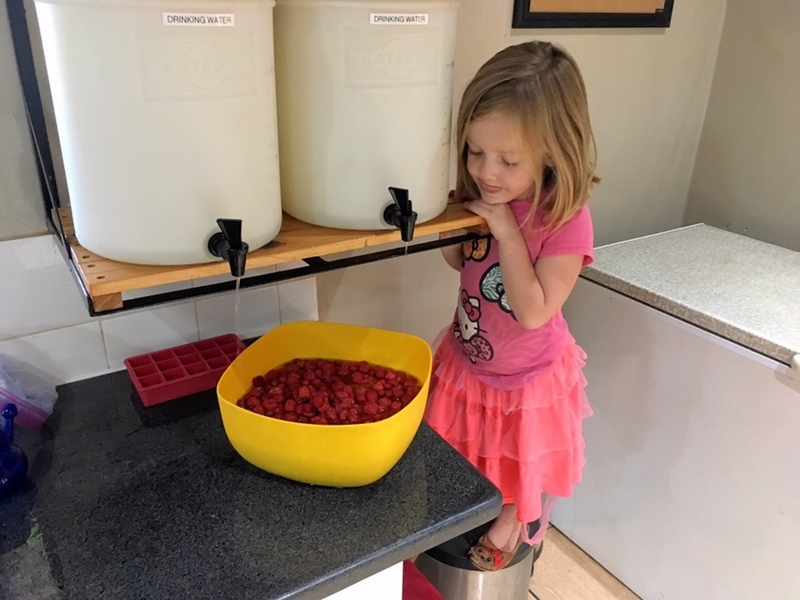 Naomi in particular loves the raspberries from Zomba (especially the yellow ones that are in season around her birthday!). 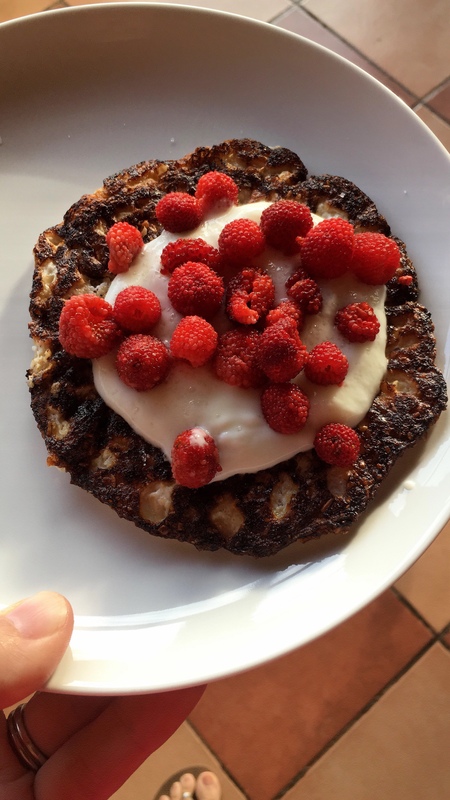 We made quick work of the raspberries and enjoyed every bite! And since mom hangs out in the kitchen, so do mom’s little friends. 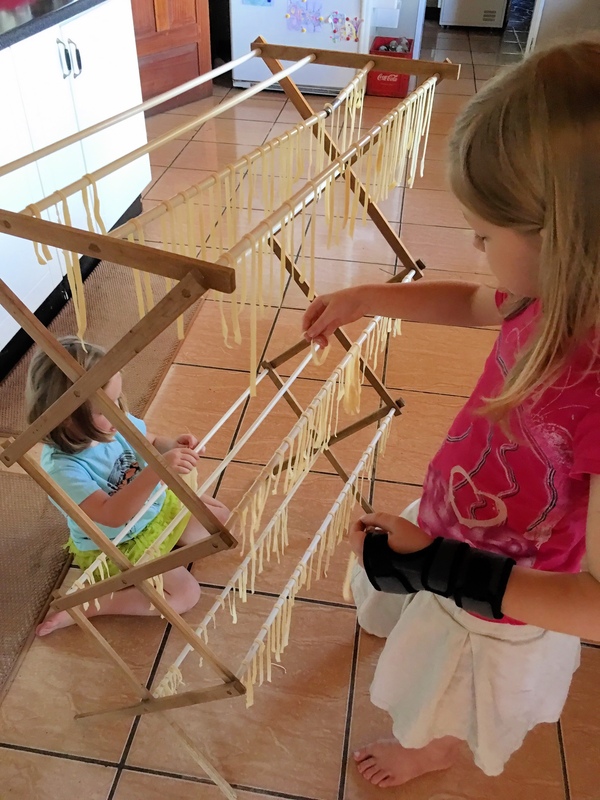 All kinds of new skills are learned here, including this current favorite. She’s actually pretty good. She just needs a little more height! 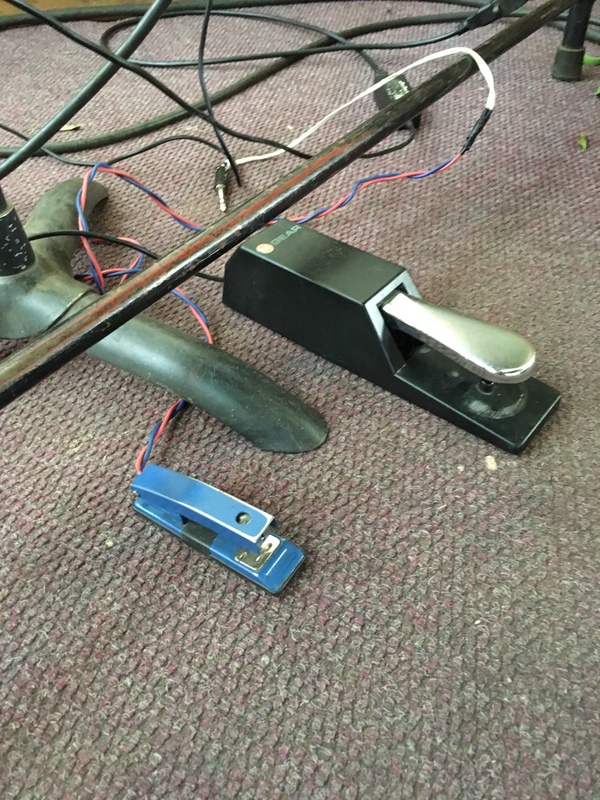 Yep, that’s a sustain pedal made from an old stapler! The chapel we rent for church services has a BYOP policy: Bring Your Own Pedal. However, since the last time I played, someone has come up with this back-up plan! I have to admit I was a little afraid of getting shocked by it, so I used the more traditional pedal. But really, this is genius! As Moses, the worship leader, said with a shrug: “TIA!” Yes, This Is Africa. And I love it! Considering the events of yesterday, we had a surprisingly good night. Matt was up to give Abi Tylenol about 11:30pm, and I was up to do the same at 3:30am. Then the girls slept until 7:01 – a Floreen girl record for sleeping in late! Right after breakfast the girls and I jumped in the car and headed back to the orthopedic doctor. They had told us to come back in the morning, so we got there about 8:30. No doctor. He wouldn’t be in until 2pm. So ended our first clinic visit of the day. Back in the car, we drove all the way across town to Partners in Hope. Dr Barrett Jones (fondly known in our house as “Judson’s Dad”) had been consulting with us since the accident the afternoon before. 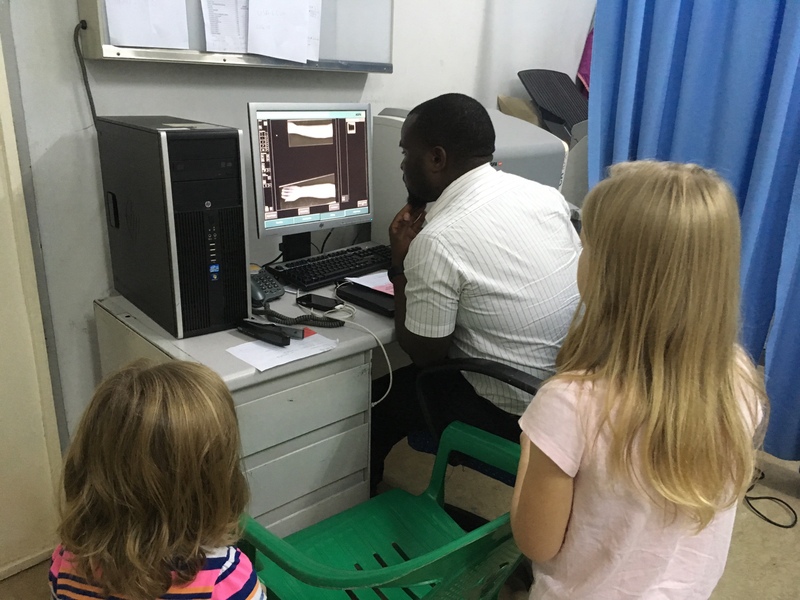 We knew he wanted to see the X-ray anyway, and we like the X-ray tech there, so we walked into our second clinic of the day about 9am. All checked in and reading Tintin comics while we wait! Abi is apparently an X-ray pro now. She knew exactly what to do. 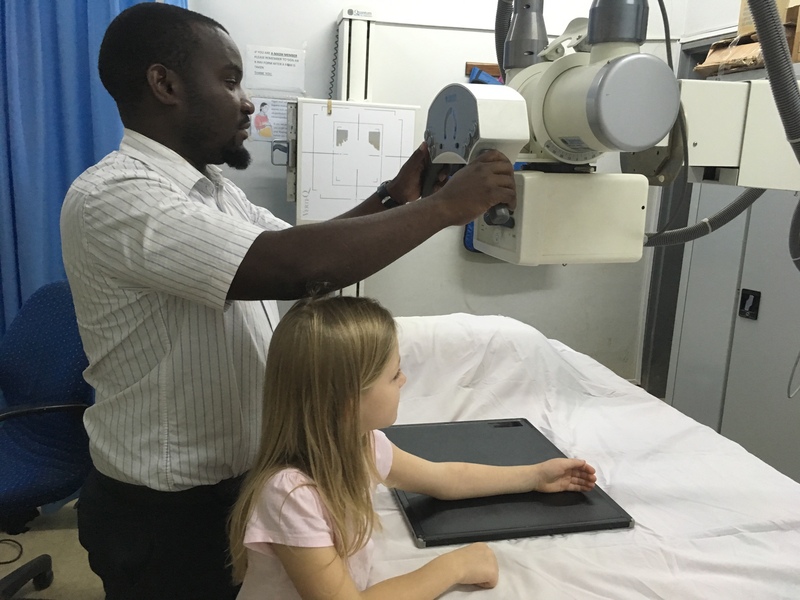 Oye, I’m sure it’s not a good thing that she’s so good at doing X-rays, or that we have a favorite X-ray tech… but I’m thankful for competent medical staff here in Malawi! Naomi came along for moral support. In the whole event of “Aslan” jumping off the ottoman that started all this, Naomi was playing Peter, brave and faithful. 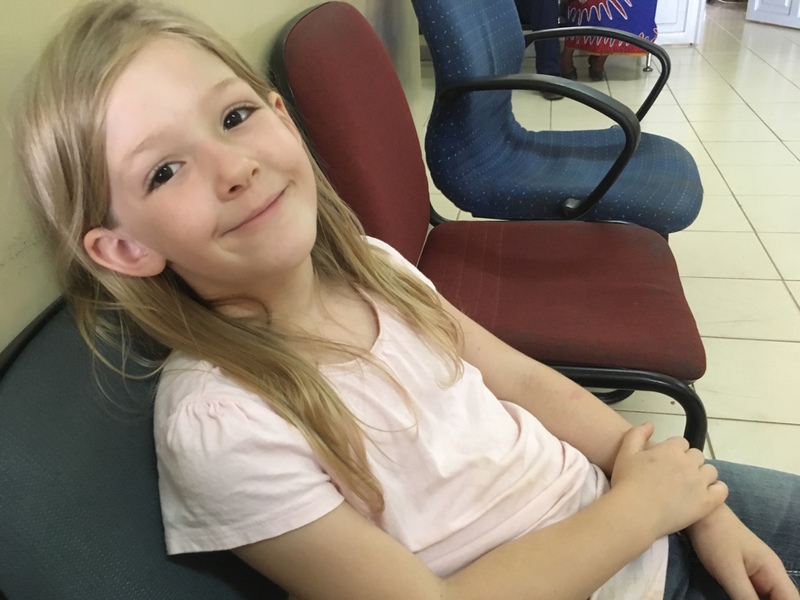 She continued in the brave and faithful role for today’s encore of clinic visits. The rest of the world is probably totally used to this, but we still think digital X-rays are fascinating! The buckle fracture is just below the mouse arrow, with evidence of the buckle on both sides. 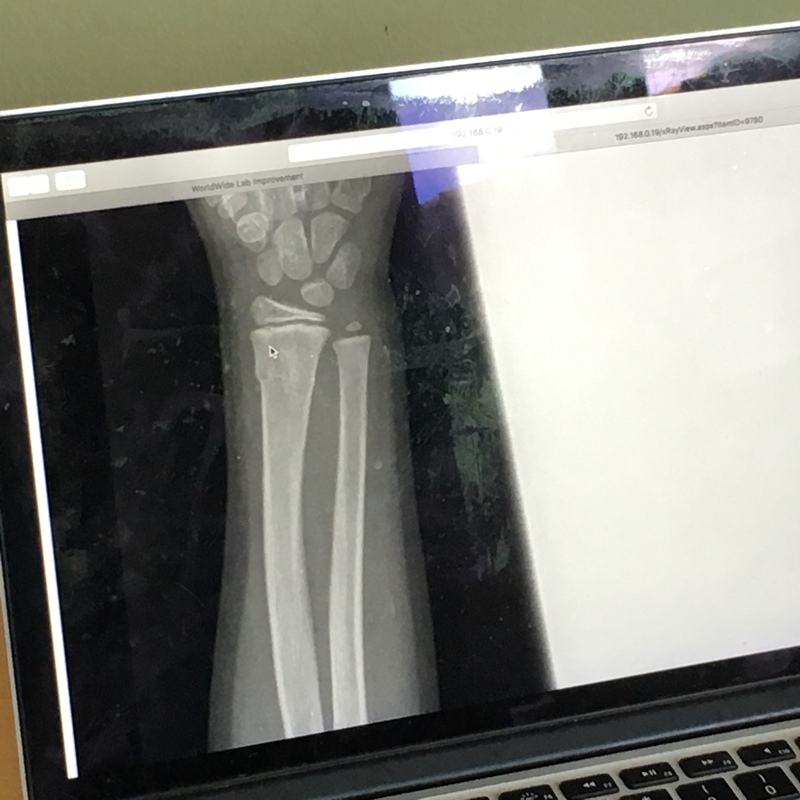 Once diagnosis was confirmed, we just needed to wait for the orthopedic guy to recheck the X-rays at 2pm and decide if we needed a cast or not. As we already had plans to meet our dear friend Rene for lunch, we kept that appointment while we waited for 2pm! Such a sweet time with a great friend! 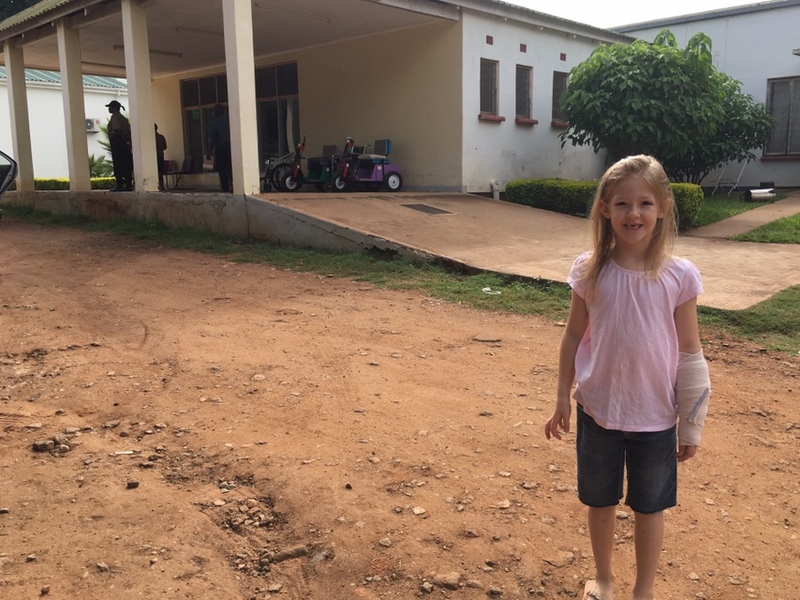 Just after 2pm found us at our third clinic visit for the day, back to see the orthopedic guy! And this time we got to see him! Dr Manda said the break would heal quickly and likely not even leave any trace of having been broken. 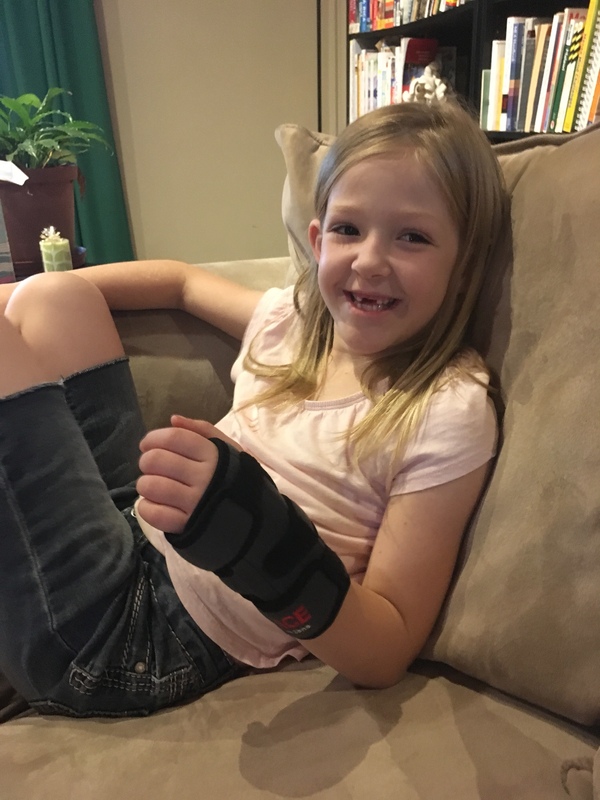 Since it was so straightforward, he recommended a brace as opposed to a cast. He also highly discouraged playing lions or any animals for the duration of the brace. Smiles all around! The brace should be with us for the next 4 weeks, with no playing animals, running, jumping, or carrying heavy objects. 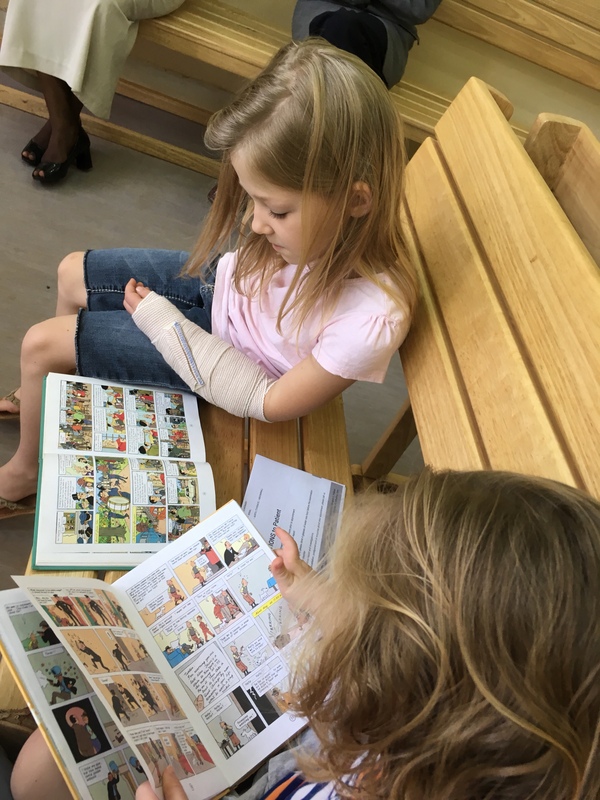 Our hearts are all lighter from the relief of just knowing what had happened to the bone and of having the wrist and arm stabilized. 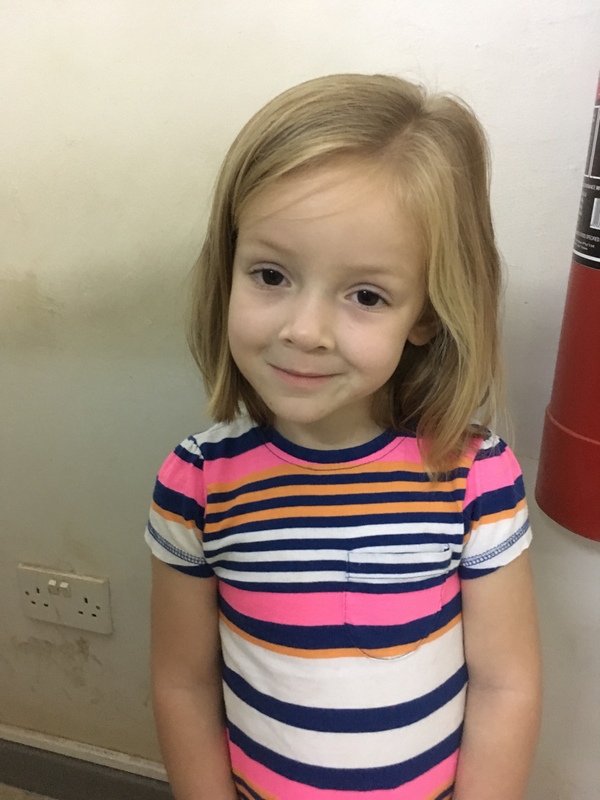 We are so thankful to the Lord for his protection of Abigail and his sustaining grace over the last 24 hours! Thank you all for keeping us in your prayers! 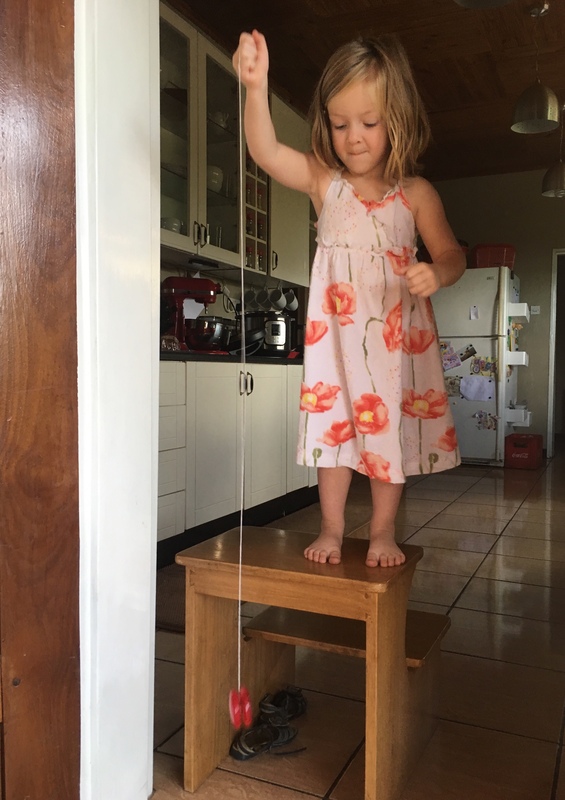 Late this afternoon, Abigail and Naomi were playing “Narnia.” Abigail was Aslan, and made a flying leap off the ottoman, to land on her hands on the hard tile floor. 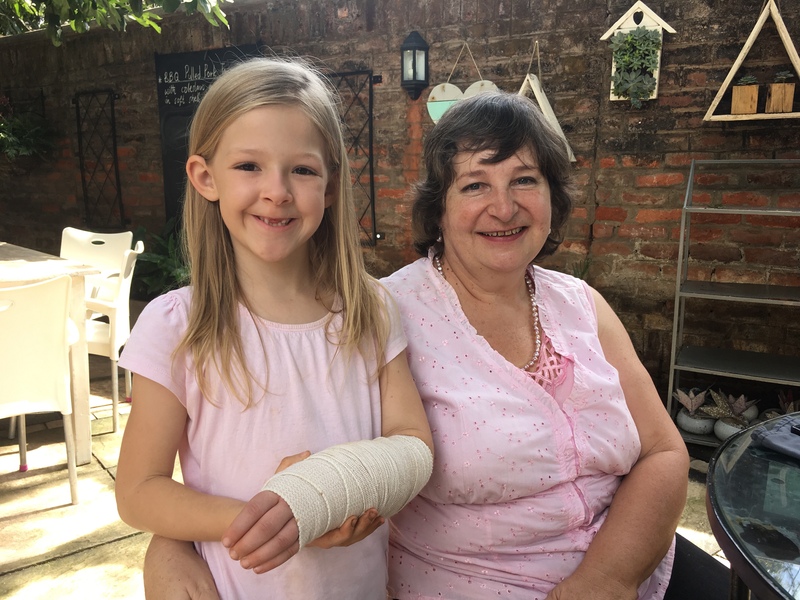 “It felt like my bone bent,” she said. Amidst much screaming. 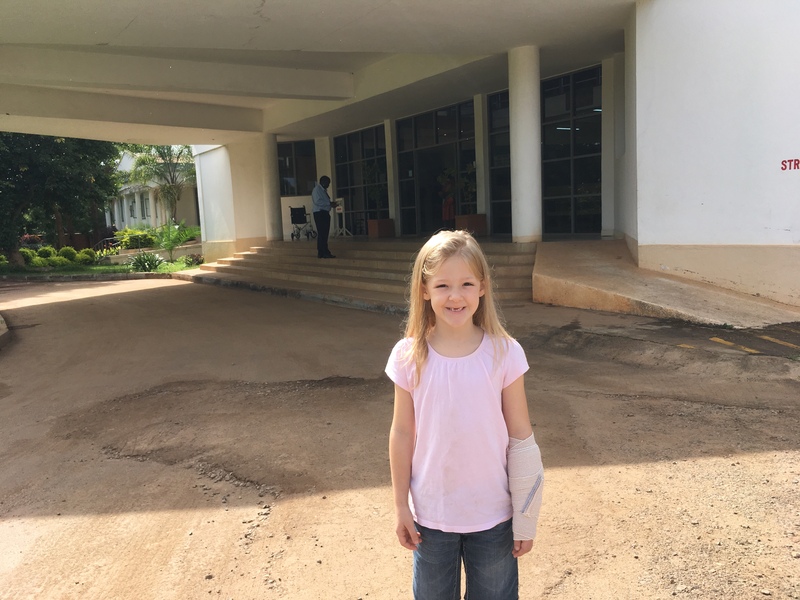 Our doctor recommended the orthopedic doctor at the Seventh Day Adventist Clinic, so we headed there. We got there just before 5pm. Abi was a champ. 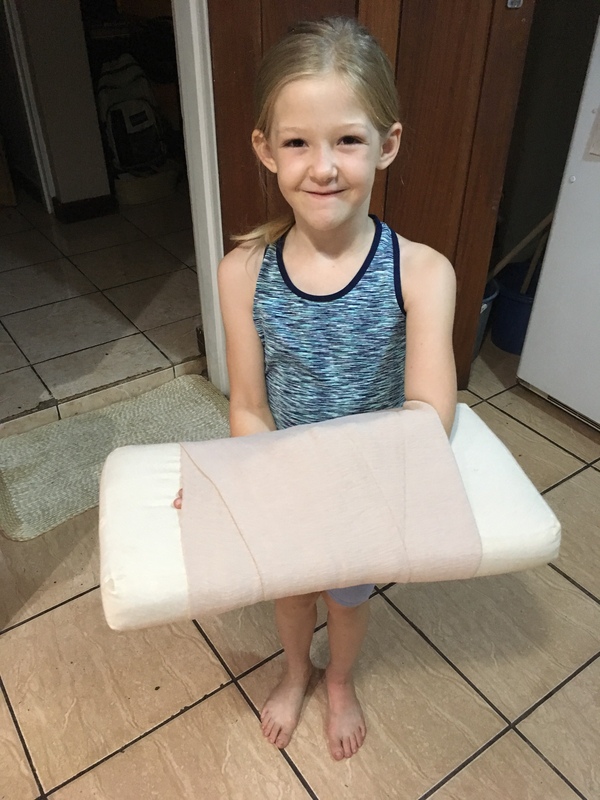 Her arm hurt about an inch above her wrist, and there was no big bump or obvious break, so I wasn’t too worried about displacement of the bone. 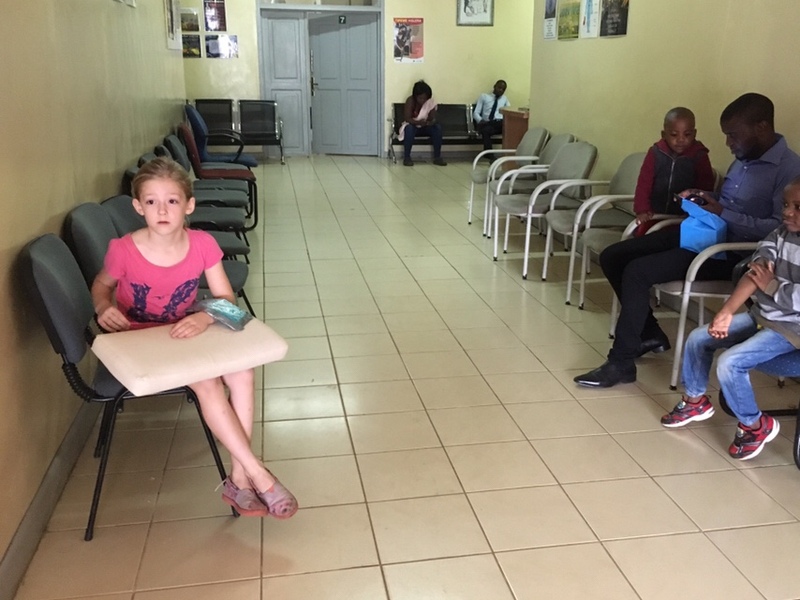 We checked in at the clinic and waited. Back in another part of town, Matt dropped Naomi off at the Kopps house, and told them Abi wouldn’t be joining them tonight. They were both supposed to hang out with the Kopp family tonight while Matt and I went on a date. We had called in an order for our favorite Indian food and we were going to take it home and watch a movie. 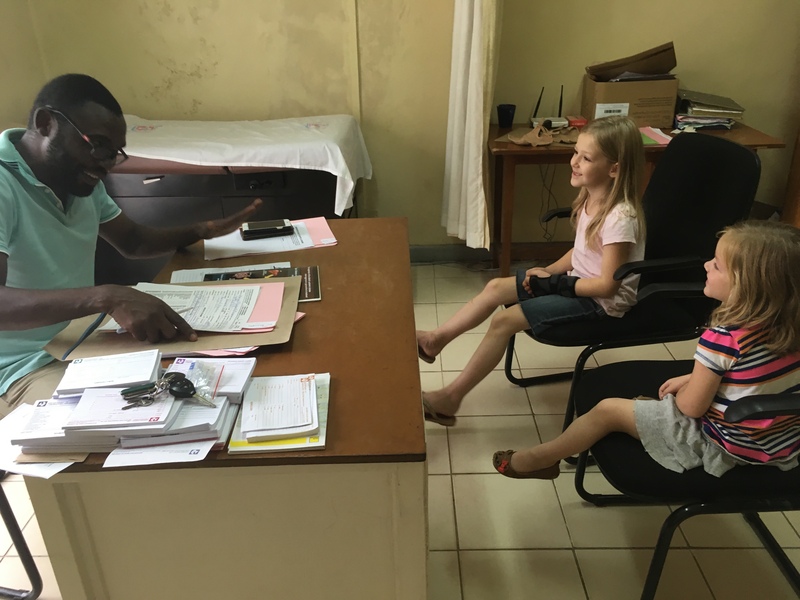 Instead, he picked up our food and met Abigail and I at the clinic, where she got to join us for our dinner date! A little after 6pm, I started asking questions. Where was the Dr? Could we just go ahead and get an X-ray while we waited? Not many answers were forthcoming. Someone tried to call the orthopedic doctor, but he didn’t answer. Finally, another doctor told us the orthopedic guy had gone home for the night about 45 minutes ago, and besides, their radiology department closed at 4:30pm. Hmmm. That would have been nice to know when we arrived just before 5pm. The doctor told us that at this time of evening there was almost no place in town to get an X-ray that was not considered an emergency. He was very kind though, and gave us a reference to a diagnostic clinic in another part of town (Area 6) that could do the X-ray. We headed to the car, and had a frank discussion with Abigail. We knew even if we got the X-rays, no one would be able to treat her arm until the morning. In the end, we all agreed to go home, gently splint her arm, and try again in the morning. So she’s in bed now, with her arm wrapped in an ace bandage and strapped gently to a foam cushion. Poor kid! Please pray for her tonight. Pray she can sleep well and that we’ll be able to get this taken care of quickly in the morning! I love Haviana flip-flops, and I wear them about 80% of the time. I know, they have no support and are killing my feet, but they are so easy, they breathe great in the heat, and they dry quickly in the rains. So when my only pair of Haviana flip-flops broke, I needed to fix them. 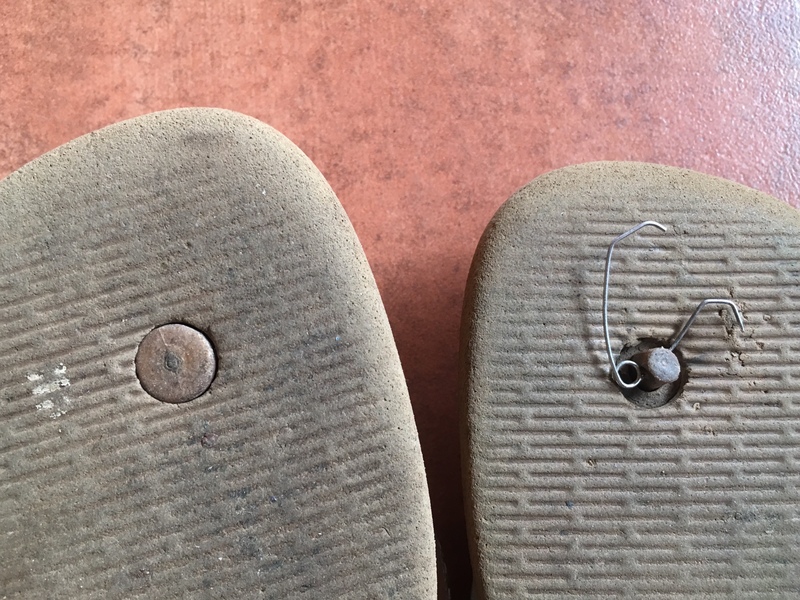 The causality was the little button on the bottom of the shoe that holds the toe straps to the sole. Glueing it back together does not work – tried that before. So this time I used a large safety pin, as seen in the picture above. It works great! It’s been there since the beginning of December (6 weeks now), and the only drawback has been that it gets caught in thick carpet. But really, we live in the tropics and thick carpets aren’t very common in our hot wet weather, so it’s really not a problem! Yes, I will buy myself a new pair of Havianas when we are next on furlough, but for now: problem solved!